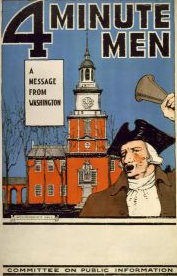 Four-Minute Men gained their nickname because of their four-minute speeches concerning the importance of backing the nation's participation in World War I. In 1917, after a German submarine sank the Lusitania, the federal government created the National Four Minute Men's Association to inspire support for the war effort. The association was also called the Flying Squadron. Men with public-speaking experience, who had been approved by local civic and business leaders, were invited to address professional, civic, and other groups on the need to engage in supportive activities, especially investment in the Liberty Loan and Thrift Stamp campaigns and the United War Work Campaign. In North Carolina, the Four-Minute Men were formed under the direction of John Sanford Martin, private secretary to Governor Thomas W. Bickett, with the primary objective of encouraging the purchase of war bonds.